Nationally speaking, the name Tim Cate doesn’t necessarily jump out in the world of golf course architecture. In fact, many people in the country probably never heard of him. In the Coastal Carolinas, though, Cate needs little introduction, especially along the Grand Strand or golf mecca of Myrtle Beach. Basically, along this 60-mile coastal stretch that runs from Georgetown, S.C., to Calabash, N.C., Cate is one of the most successful and popular architects around – having designed numerous top-ranked courses such as Panther’s Run and Tiger’s Eye at Ocean Ridge Plantation, the Players Club at St. James Plantation and The Thistle Golf Club, to name a few. Nowhere is Cate’s name more prevalent and appreciated than Ocean Ridge, a 1,300-acre resort-style development where Cate got his start in1990 working under architect Willard Byrd on the community’s initial “Big Cats” layout called Lion’s Paw. Two years later, Cate, now working on his own, was picked by then-Ocean Ridge owner Ed Gore to design the second course, Panther’s Run, and the Cate cat was out of the bag. In fact, Panther’s Run proved to be so successful, Cate was asked to come back and design two more Big Cats courses: Tiger’s Eye, ranked by Golf Digest as one of the “Best New Courses in America” when it opened in 2000, and Leopard’s Chase, listed by Golf Digest as one of the top ten new public courses when it opened in Spring ’07. How good is Cate’s course work at Ocean Ridge? It’s so well received that Cate is now working on an astonishing fourth new course at the Sunset Beach, N.C., community. Known as Jaguar’s Lair, this final course to the Big Cats collection will likely open sometime in 2010. Having designed four courses at one development, and collaborated on a fifth, is a feat likely surpassed only by Jack Nicklaus, who has six private courses to his credit at Desert Mountain in Scottsdale, Ariz. Based on the quality of Cate’s work, Ocean Ridge Plantation executive Becky Noble doesn’t understand why the Sunset Beach-based architect isn’t as widely recognized as some of the other top-tier designers. Noble can’t wait for Cate’s latest Myrtle Beach-area masterpiece to open. According to Noble, the back nine holes have been completed and grassed in except for the greens, but the front nine is still in its preliminary stages. “He gets better with every golf course,” Noble says. “And it’s hard to say that because each golf course is unique in its own right that he’s created. We’ve certainly been ecstatic about the work he’s done at Ocean Ridge, especially relative to Tiger’s Eye and Leopard’s Chase. 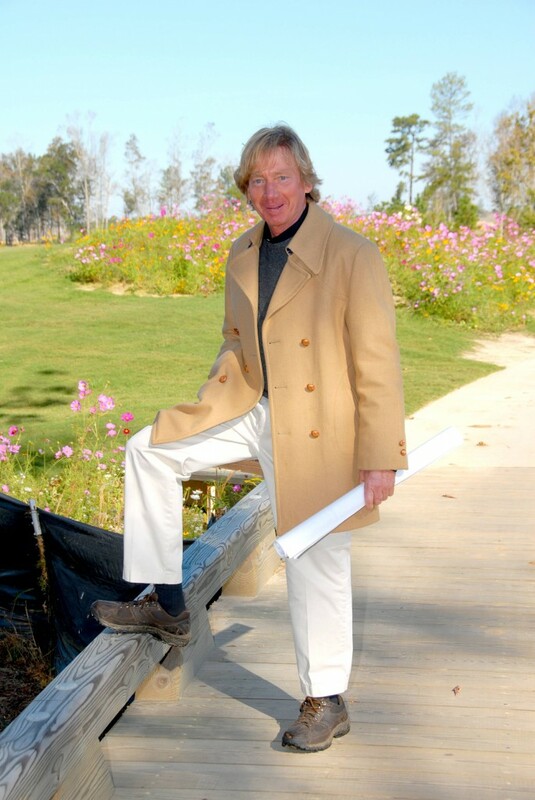 When it was time to build the fifth course at Ocean Ridge, Noble says there was never any question that the new owner, Mark Saunders and The Coastal Companies, would seek out another designer. Another new project that is sure to garner a lot of attention is Cape Fear National Country Club, an exclusive 27-hole facility scheduled to open 18 of its holes next fall in Wilmington, N.C. Located just minutes from historic Wilmington, Cape Fear National will be one of the signature amenities at Brunswick Forest, an upscale private 4,500-acre retreat backed by Lord Baltimore Capital Corporation, a private investment group with more than $2 billion in assets. Plus, some of the Brunswick Forest partners had experience with Cate at Ocean Ridge, according to Spirer, and they remembered he was dependable, talented and had great attention to detail. A proud and modest man, the media-shy Cate, 54, is clearly excited about his latest creation. “It’ll blow everything out of the water up there,” says Cate, who graduated from the University of Georgia in 1984 with a degree in Landscape Architecture. “You could bring that down here (to Myrtle Beach) and it would be one of those top-five, best new courses and all that stuff. Up there in Wilmington they’ve never had competition like they have down here. “I think the people that play it are going to be pretty surprised at what they see. If there’s one trademark to Cate’s world-class work, it’s his sophisticated touches both on the course and amongst the course’s immediate surroundings. As KemperSports regional sales and marketing director Chris Schwartz puts it, Cate’s detailed overall landscape design elements are what set his courses apart. For example, at Cape Fear, many of the hazard areas are accented by colorful plants and native grasses. The course also features more than 1,500 linear feet of bridges, three separate waterfalls, several ponds, strategically placed rock walls, drive-through sand waste areas, and beach bunkers that run into the ponds. In the end, all of this makes for a challenging and aesthetically pleasing golf experience. “My golf courses are totally molded and marry up to whatever site they’re going to be on,” says Cate, who has three grown daughters. “They’re all so dramatically different and really take on the character of each site. (The golf course) complements the site heavily and the site complements it. They work together. As one critic aptly described Tiger’s Eye, the course has character on every hole and doesn’t take a hole off. In essence, that sums up Cate’s overall golf course design work, which he certainly doesn’t view as a job. “To me it wasn’t a business,” Cate says. “There’s a lot of architects out there where it is a business. It’s easy to see that in these golf courses I’ve got all around. You know it’s like my client at St. James said, and I won’t say what other architect he was talking about up there, but he says I put more thought on one hole than the other guy did in the whole golf course. As for a 26-year solo career that seems to have been confined along a high-profile stretch of the Carolina Coast, Cate is perfectly content about the regional nature of his profile. In fact, Cate says the long-distance travelling was one reason he left Byrd to set up his own shop. “I was sitting in airports till 12 o’clock every night, flying around here and there, and it got to where I wasn’t enjoying that at all,” Cate adds. “When I was offered (the Ocean Ridge assignment), I jumped on it in a New York minute. Indeed, if history is any indication, there is little doubt that Cate will always be considered for work along the Carolina Coast.